Researchers at the University of New Brunswick and the Centre de formation médicale du Nouveau-Brunswick, in collaboration with researchers at the University of Saskatchewan and partners in Saskatchewan, are developing online training for early childhood educators based on findings from their recent study that saw improvements in nutrition and improved gross motor skills among preschoolers in New Brunswick and Saskatchewan after providing training in childcare centres. The research was conducted as part of the Healthy Start-Départ Santé initiative, funded by the Public Health Agency of Canada’s Innovation Strategy on “Achieving Healthier Weights in Canada’s Communities” program. Healthy Start-Départ Santé trains early childhood educators in increasing opportunities for improved nutrition and increased levels of physical activity in early learning environments. The aim is to help children adopt healthy lifestyle habits, before age 5, that can continue to benefit their health throughout their lives. They found that childcare centres who received this training served more fruits and vegetables, demonstrating an improved understanding of nutrition. They also found an improvement in the children’s gross motor skills. Though the research has not yet been published, the preliminary findings were presented at the HSDS Symposium in Saskatchewan in January 2017. The cost of health care is a growing concern for New Brunswick. Statistics Canada reports that approximately 64 per cent of the population is overweight or obese. Education surrounding nutrition and physical activity may be crucial to lowering health care costs related to chronic illnesses in the province. The project has been approved for a third round of funding by the Public Health Agency of Canada, which will support scale up and long-term sustainability. Part of this strategy is to deliver an online training component to the project, bringing it to early childhood educators across the country. “This new phase could truly impact our youth lifestyle in Canada, potentially in the long term,” says Martin Sénéchal, assistant professor with UNB’s faculty of kinesiology. “There’s a lot of buzz going on, there’s a lot of interest, there’s a lot of excitement,” says Stephanie Ward, research coordinator at the Centre de formation médicale Nouveau-Brunswick. This bilingual online training will improve the program’s accessibility. In this early stage, there’s an opportunity for undergraduate and graduate students to become involved in the creation and implementation, allowing students to put their classroom knowledge into practice. “I’m definitely a big advocate of involving students in the project and so are Martin and Danielle, which is wonderful,” says Dr. Ward, who became involved in the project while completing her PhD in clinical sciences, focusing on community health. 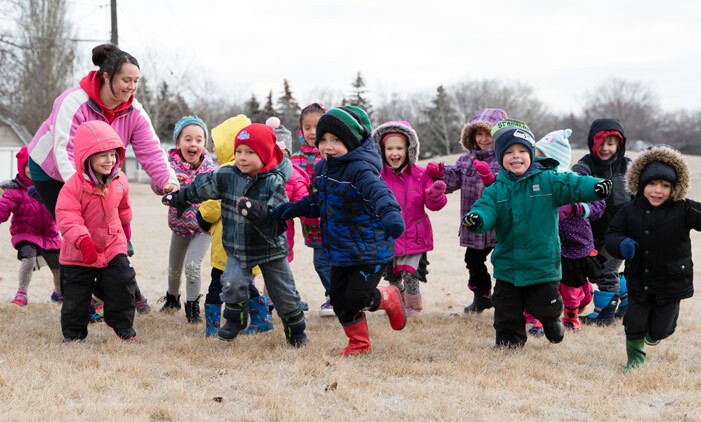 Through the use of this online medium, Healthy Start-Départ Santé is aiming to expand to 450 centres across the country from more than 300 centres now and become integrated into the early childhood education system for long-term sustainability. It’s the researchers’ hope that this work will inform future policy, create better guidelines for healthy eating and physical activity for young children throughout the province and the country.